As a buzzword, sustainability has made the rounds for years, but its definition remains as unclear as its proponents' goals. Depending on who's doing the talking, sustainability can have a wide range of definitions. The broadest definition -- that sustainability means being able to carry on indefinitely an activity -- is hard to dispute. By that definition, agriculture is largely populated by sustainable operations. Farms and ranches that have survived the ups and downs of the economy are sustainable. Many have been around for generations, and though they are sustainable, they also identify with other qualities that sometimes are not included in today's lexicon: stewardship, hard work, independence and plain old staying power. Sustainability, however, takes on very different meanings when seen through other lenses. To some folks, a sustainable farm or ranch must not have an impact on the land, air or water. To others, sustainability has to do with new technology they prefer over old technology -- even if it doesn't make sense economically. Ironically, they say sustainability is worthy of subsidies. For example, hydroelectric dams are the cornerstone of the West's economy. The power and water they provide have sustained our way of life for decades. Yet, in the view of some, dams are not sustainable and must go. In fact, the Oregon Legislature has even deemed that dams are not "renewable" sources of energy. Whether the dams are on the Klamath, Snake or Columbia rivers, they do not fit the current ideal because they have an impact on fish. The fact that they provide power and water to much of the West and help provide livelihoods for millions of people is outweighed by concern over fish. As such, they are seen by some as "unsustainable" and must be replaced by other sources of electricity. One alternative is wind power. The only problem with that is wind turbines require massive subsidies and cannot replace the constant amount of power produced by even a single major dam. 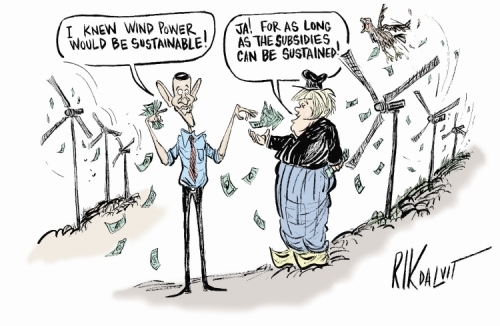 To promote wind power, state and federal governments heap on subsidies. For example, Uncle Sam provides a production tax credit of 2.1 cents for each kilowatt-hour a wind turbine produces and a 30 percent investment tax credit, according to the American Wind Energy Association. The states offer low-interest loans and tax credits, too. Biomass and other forms of producing energy such as solar panels also get healthy tax credits. But the quest to buy sustainability doesn't end there. The state of Oregon in the past two years has awarded $144 million in tax credits to companies that pursue other "sustainable" activities like building bicycle parking lots, renting out cars, burning wood to generate electricity, taking the bus and installing solar panels. These efforts are presented to taxpayers, who must foot the bill, as sustainable. One man's "sustainable" idea is another man's "subsidized" idea. Beyond all of the talk is a single economic principle. No matter how "sustainable" a project is, if it doesn't make money it will eventually fail. Ask any farmer or rancher. If it isn't profitable, it won't be sustainable.